"Project MJOLNIR will make the Spartans into something . . . new. Something I could never forge them into. I can’t fully explain — that damned ONI spook is still here listening — just trust Dr. Halsey." The MJOLNIR Powered Assault Armor System (pronunciation:ˈmjɔːlnɪər, myol-neer) is a technologically advanced combat exoskeleton system designed to vastly improve the strength, speed, agility, reflexes and durability of a Spartan supersoldier. Though the development program is rendered in all capital letters (i.e. Project MJOLNIR), the armor itself is called Mjolnir. The suit is named for the hammer of Thor in Norse mythology. The Mark V MJOLNIR armor. 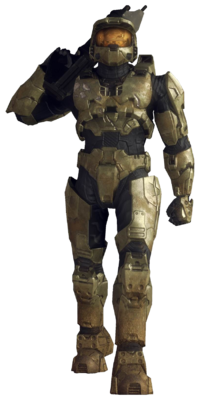 Created parallel to the SPARTAN-II program by the Office of Naval Intelligence's Materials Group, the Mjolnir armor is the most advanced piece of tactical military hardware in human hands. Each suit alone costs as much as a small starship. Ostensibly the brainchild of Dr. Catherine Halsey, MJOLNIR is an attempt to create a powered exoskeleton capable of taking full advantage of the physical capabilities of a Spartan. MJOLNIR's development actually came about due to a millennia-old geas that manifested itself within Halsey. Near the end of the Forerunner-Flood war, the Librarian planted genetic directives that would lead to the development of powered armor, along with the creation of the Spartans and sophisticated artificial intelligence. This was done in preparation for humanity's task of reclaiming the Mantle. Spanning over three decades of development, Project MJOLNIR encompassed more than just a suit of armor, but as a pioneering effort intended to shatter current technological barriers. In its final iteration, Mjolnir is a highly advanced suit capable of further enhancing the Spartans' physical performance while also doubling as a platform capable of handling an artificial intelligence network. Unlike the powered exoskeletons that preceded it, the Mjolnir battlesuit was designed from the ground up as a suit of armor; its design philosophy would serve as a basis for all future powered and semi-powered armor system designs. Each generation of the Mjolnir battlesuit is composed of major fundamental components; construction of the suit is done in overlapping layers and has been remarked of it being akin to a giant three-dimensional puzzle. The armor's shell is composed of a multilayer alloy of remarkable strength and has been augmented with a refractive coating capable of dispersing a limited amount of Covenant energy weapon strikes. The suit contains a gel-filled layer underneath a thick black armored bodysuit. The gel layer regulates temperature and can reactively change its density. The inner skinsuit is made of a moisture-absorbing synthetic material linked to an environment control computer and the occupant's UNSC-issue neural interface. The battlesuit is a sealed system, capable of extra-vehicular activity for a limited amount of time or operations in toxic atmosphere. It is hardened against EMP and radiation, and has filters that are completely effective at removing toxins and bacteria from local atmosphere. Between the external armor and the internal padding is the most devastating weapon the suit carries: a layer of polymerized lithium niobocene, a liquid metal crystal that deforms along a preferred axis when exposed to an electric charge. Woven by molecular tools into a capillary system, this layer is amorphous, yet amplifies force, doubling lifting capability and increasing reaction time by a factor of five. Because the Mjolnir system is so reactive, it can only be worn by a physically augmented human; ordinary people are unable to use the suit without injuring themselves. The Mjolnir battlesuit's greatest advantage, however, is a super-dense optical computer memory. This revolutionary solid-based crystalline layer forms a network within the suit's frame of proper size and capability of housing the types of artificial intelligence usually reserved for starships. Essentially a piggyback system, an AI can be delivered to the suit via a data crystal chip storage device no larger than a personal credit card. The AI's personality and processing matrices can be carried by the armor and in conjunction with the user, can neurally link with a being that has nearly unfettered control over mathematics, information and body control. Such technology did not exist when work began on the Mark I prototypes. The functionality of the Mjolnir system is unprecedented. Rather than being a traditional suit of body armor, the Mjolnir battlesuit works on a biomechanical level, allowing for direct user-controlled movement. Each human being has a molecular fiber network called the nervous system within their brain. Upon induction, all military personnel are issued a neural interface, which is implanted at the base of the skull and cannot be removed. Spartan-IIs received a modified version of the neural lace specifically for the Mjolnir armor. This neural lace, which consists of two core processor chips which is linked to receptors in the subject's brain, which is connected to an interface connection at the rear of the skull; reads the electrochemical signals sent from the brain and then translates these chemical signals into digital code. As the electrochemical impulse travels down the axon to the muscle, the digital code is routed through the interface connection, to the suit's on board sensors, the input from the sensors is then read by the onboard computer and then like the human body itself sends an electrical impulse through the suit, as the impulse from the motor neuron hits the muscle, the electrical impulse from the suit causes the polymerized lithium niobecene to deform along a preferred axis, overlapping each other more, so that the layer gets shorter and fatter. When the impulses from the suit stop, the polygonal pieces slide back to their original positions. At the same time, as the muscle fibers are responding to the impulses, signals are sent to the suit that this is occurring, as the muscle twitches the force being applied to the suit is accelerated through force-multiplying circuits, which amplify the force of the muscular twitch by a positive feedback loop in the armor. The end result is a fully neurally linked machine, the user's thoughts move the suit and in return the suit moves the user. The synthesis of machine and mind is so fast that it is almost impossible to chart reaction time. The suit also possesses other features that enhance its wearer's abilities. It has numerous clips, belts, and magnetic holsters for the attachment of additional weapons and ammunition; an advanced heads-up display (HUD), linked to sensors in the gloves which can detects the type of weapons and devices held, and to project shield strength, ammunition count, a targeting reticle, waypoints, a radio uplink for communication, health monitoring and restoration system, regenerative food materials and other helpful data. In its final phase, the Mjolnir battlesuit weighs half a short ton, or 1,000 pounds, and is a fully neural-linked system. With an on board AI using the human mind for parallel processing, the Spartan/Mjolnir combination is designed to be the most devastating intelligence tool ever created. Before Dr. Halsey began Project MJOLNIR, the Materials Group had been evaluating the combat potential of powered exoskeletons for at least eleven years, producing three distinct exoskeleton models: the Mark I, the Mark II, and the Mark III. When Dr. Halsey and the Materials Group abandoned the exoskeleton project for MJOLNIR, they ceased using the "Mark" generational naming system, as Halsey intended for MJOLNIR to be a single, continuously upgraded system, and wished to distance herself from the unsuccessful exoskeleton project. However, in 2535, the Office of Naval Intelligence mandated that the "Mark" system be used to distinguish different versions of the MJOLNIR Powered Assault Armor as a means of fiscal oversight. Though Halsey disliked the system, she agreed to produce the Mjolnir armor in distinct stages rather than through incremental improvements; the original version of MJOLNIR was thus retroactively named "Mark IV", referencing the long-abandoned exoskeleton project that had preceded MJOLNIR. After the end of the Human-Covenant War, the Materials Group developed the second system-wide generation of MJOLNIR, simply designated GEN2, as a response to the SPARTAN-IV project. GEN2 is lighter than the Marks IV through VI and is far more modular than previous systems. The previous iterations of MJOLNIR were retroactively designated GEN1 to distinguish them from the GEN2. Initiated in 2515, the Mark I was one of ONI's first experiments with powered exoskeletons. More human-powered defense structures than suits, the Mark I took ten years to develop, but was bulky, unwieldy and needed to be tethered to a power source due to the tremendous amount of energy needed to power it. This caused the system's downfall, as it required a physical connection to a fusion generator which hindered movement. The Mark I prototype exoskeleton improved the strength and stamina of the wearer and allowed the user to lift two tons (4,000 pounds) and run at 32 km/h (19.88 mph) for extended periods of time. The Mark I contained a cutting-edge onboard computer that could assist the wearer by transmitting tactical and communications information to the standard neural implant issued to a soldier, though the suit did not possess the ability to carry an AI. The armor could also be equipped with motion sensors and infrared scopes, and it could be mounted with a 30mm minigun that fired on self-targeting armatures. Research and development for the Mark I was carried out at Section Three's headquarters inside CASTLE Base on Reach, though the final assembly of components occurred at the Damascus Materials Testing Facility on Chi Ceti IV. At least forty Mark I suits were produced; although they never saw battlefield deployment, many were converted to carry heavy equipment in docking bays, and dozens of others were dumped into Reach's titanium mines. 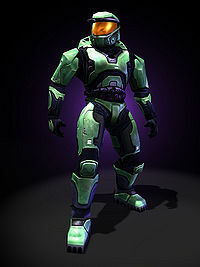 The Mark I exoskeletons were later used by trainers of the SPARTAN-IIs to protect themselves against the Spartans' newly acquired strength. Otherwise, the training could have killed them, as evidenced when three trainers were accidentally killed during hand-to-hand combat exercises against the Spartans. The Mark II exoskeleton was similar to the Mark I, but it had a slimmer profile which greatly increased mobility. 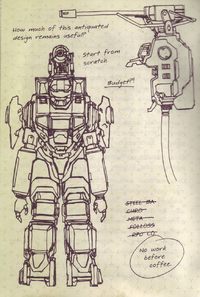 However, the suit still needed to be tethered to a fusion generator, so despite being the most powerful piece of military hardware of its time, it was still impractical for battlefield deployment. The Mark II included a refractive coating to help disperse heat from explosive attacks and better self-sealing systems in the event of damage while the unit was in vacuum. Introduced in 2510, the Mark III incorporated a wireless power transmitter and receiver so that power could be transmitted directly to it, much like the orbital defense platforms used to defend UEG colonies. This design was quickly rejected for two reasons: first, the armor still had a limited operational range as it had to remain within range of a bulky, immobile generator. Second, if the generator was disabled or destroyed, the suit would be disabled, leaving its user trapped inside a useless shell, helpless against enemy attacks. In the end, all of the first three prototypes had one thing in common: It was impractical on the battlefield, as its range was severely limited by the lack of a mobile power source. The HRUNTING Mark III Cyclops (introduced in 2513) was derived from the Mark III prototype. Although earlier attempts at developing high-powered armor produced designs that were impractical for battlefield deployment, the Mark IV Mjolnir powered exoskeleton would be the first successful powered armor system that saw deployment onto the battlefield. Developed by Dr. Catherine Halsey, the Mark IV was a radical redesign of powered exoskeletons making use of technological innovations that did not exist when work on the previous exoskeletons began, such as a miniature fusion reactor embedded in later versions of the armor. The Mark IV Mjolnir armor was fielded from November 27, 2525 to November 24, 2551. The Mjolnir Mark V is the first major upgrade of the system and introduced two revolutionary technologies for battlefield purposes: energy shielding reverse-engineered from Covenant technology, providing the user added protection against plasma weapons, and the ability to link a soldier and an artificial intelligence together to provide the soldier instant intel in the field, along with other functions. In addition to major changes from the Mark IV, hundreds of other technical improvements are incorporated into the Mark V: for example, the fusion packs used to power the suits are half the size of their predecessors. The Mark V was fielded from November 24, 2551 to October 20, 2552. Created by a top-secret parallel development lab in Seongnam, Korea, MJOLNIR: Black was a standalone "skunkworks" prototype of the Mark VI issued exclusively for Team Black. It features a number of advances over contemporary Mjolnir exoskeletons. It was used on Verge during the Covenant invasion of the Epsilon Eridani system and during Operation: BLOWBACK some time after. The Mjolnir Mark VI is the third primary version of the system. It introduces several technical improvements while refining advanced technologies introduced in the previous system. The first improvement made to the system is a faster recharge time on the suits' energy shield system so that the Spartan-II super soldier does not have to remain in cover for an extended period of time. The second is improved synchronization between the suit and user, this allows the Spartan to jump higher, run faster, and hit harder than a Spartan could previously. The Mark VII is the fourth major iteration of the Mjolnir armor introduced in January 2553. It is lighter than the previous first-generation suits, with new features including limited energy shield shaping and a nanotechnology repair suite. Ultimately, the Mark VII was never widely issued as it was deemed too complex and expensive for mass-production, particularly in light of the development of the more versatile GEN2 platform which enabled more economical optimization for the different Spartan generations in service, while the first generation was mainly optimized for the Spartan-IIs. Generation 2 Mjolnir [GEN2] is a program-wide overhaul of the system primarily developed for the Spartan-IVs. Its most notable feature is the radical streamlining of the exoskeleton architecture, with the number of complex components reduced by an order of magnitude in comparison to GEN1 suits. The GEN2's design philosophy is geared toward integrating the vast majority of the armor's vital hardware into the bodysuit, known as a techsuit, enabling more streamlined production and easier implementation of specialized components. However, this sacrifices some of the suit's efficiency, and the performance improvements over GEN1 Mjolnir are minimal. The second generation uses a spiral-development model of production, enabling the UNSC and its corporate partners to iterate on the armor systems much faster and more efficiently than with the first generation. GEN2 is produced by half a dozen manufacturers, both within the military and among private contractors. It is equipped with new ad hoc modification systems which gives the armor the ability to use tactical packages, support upgrades, and armor abilities. 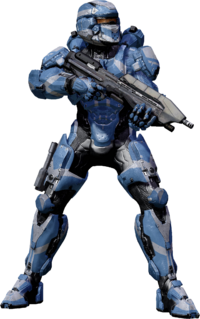 The Warrior variant serves as GEN2's mainline armor kit, as well as the most widely utilized, though the Recruit variant is issued to all newly inducted Spartan personnel. MJOLNIR [GEN3] is the planned third generation of Mjolnir armor. Existing as of yet at the conceptual stages, the [GEN3] design framework incorporates lessons learned from [GEN2] line of Mjolnir, while also seeking to restore some of the favorable characteristics of the [GEN1] line. The MJOLNIR [GEN1] Mark VII is being used as the testbed for the [GEN3] improvements. The inner skinsuit is made of a moisture-absorbing synthetic material linked to an environmental control computer and the occupant's neural interface. It controls the suit's temperature and actively changes how the suit fits the user. On top of the inner skinsuit is a gel-filled layer, which regulates the temperature of the suit and can change its density to conform to the wearer's shape. The temperature inside the suit is controlled by the moisture-absorbing cloth suit underneath the hydrostatic layer. The hydrostatic gel layer can also be pressurized to various levels to potentially save the wearers life should the wearer be subjected to high G forces or a high velocity impact; however, overpressurizing this layer can cause nitrogen embolisms. Fitted in between the outer plates and the inner padding, is a layer of piezoelectric liquid crystal that deforms along a preferred axis when exposed to an electric charge. This layer acts as a sheath or a suit of artificial muscle; this reactive piezoelectric effect increases the strength, reaction time, mobility, speed, and all around physical performance of the suit's user. The material is amorphous, which circumvents a major obstacle in its design: custom fitting millions of the polygonal pieces under the second armor layer. Knitted together at a molecular level the liquid crystal material is merely "poured" into a multilayered Sierpinski capillary system where microelectric fields can direct crystallization geometries. The only downfall is the materials production, which involves classified super-toxic precursor materials and requires a zero-gravity environment. As such this layer accounts for over eighty percent of the Mjolnir armor's cost of construction and materials. The pressure seal is a vital component to the MJOLNIR system, it keeps the system airtight, underwater or in space. The seal is very strong but will only break under extreme pressure, such as in a high velocity impact or when the hydrostatic gel has been overpressurized. The MJOLNIR Mark VI's nanocomposite bodysuit. Sandwiched between the external armor and the internal padding is a thick black armored bodysuit. This suit has numerous functions, small but vital to the safety and survival of the wearer. The bodysuit is made of a titanium-based material, making it very strong and yet very flexible. It also serves as another layer of protection against ballistics attacks and is coated with a heat resistant material to disperse heat from plasma weapons. Known to be present in the Mark V and VI generations, biofoam injectors are an integral part of the systems ability to keep a Spartan-II functioning in battle. Biofoam is a medical gel that is used to fill and seal a wound automatically, it is also used to treat any infection that could occur as a result of the wound. The process of injecting, or applying the gel to a wound is extremely painful and is only a temporary solution; medical attention must be sought soon after to ensure survivability. Located throughout the armor, these systems boost the force applied by the user. They make hand-to-hand combat easier, but also make the armor difficult to adjust to; a slight motion can be translated into a potentially harmful one if not conducted correctly. For this reason it is only possible for Spartans to use this armor, as their strengthened bodies are able to withstand the increased power and speed of movement, which, in unaugmented human bodies, results in broken bones or death, due to spasms caused by the pain of broken bones. Reactive Circuits are systems installed directly linked to the Spartan neural interface. They amplify the wearer's reaction time by connecting directly to the thoughts of the wearer, making it much easier to control and allowing for the soldier to be both more efficient and have a higher survival rate in combat. The lockdown system protects muscles and joints from traumatic, high-impact injuries by seizing the suit into a rigid posture through modifying the density of the hydrostatic gel layer. The outer shell of the Mjolnir armor is comprised of a fairly thick titanium alloy. This alloy is very resilient, can take significant punishment, and is nearly impervious to small arms fire. While enough shots from armor piercing rounds will breach the outer shell, the suit can take a few glancing blows from them without compromising the armor. The outer shell of the MJOLNIR suit is covered with a refractive coating to help disperse the heat experienced from Covenant energy weapons. However one or two direct hits from any Plasma weapon will compromise the armor plating. The Mjolnir helmet is one of the most vital aspects to the MJOLNIR armor system. It is made of titanium and features a heads-up display, that links to the brain and hands, and can identify equipment and display information about it when it is picked up by the wearer. An environmental control unit that includes filters to remove toxins from the atmosphere, and a rebreather to automatically supply oxygen to the wearer during EVA. In addition the helmet is packed with thermal and motion sensors, communications, solar-powered lighting, and imaging and video gear. The most important feature though, is the direct neural interface system which connects to a Spartan's neural implants. Two core processor chips are implanted into the subjects skull in the rear of the head. This is essentially comparable to an on board computer using parts of the human brain for processing - when the connector at the rear of the subject's head and receptors in the brain link to the helmets on board sensors it creates the neural link needed to move the MJOLNIR suit. The outer shell of the Mjolnir armor is composed of a fairly thick titanium alloy. This plating covers the chest, arms, hip, legs, calves, feet and hands. This alloy is very resilient, can take significant punishment, and is nearly impervious to small arms fire. While enough shots from armor piercing rounds will breach the outer shell, the suit can take a few glancing blows from them without compromising the armor. The outer shell of the all MJOLNIR suits is covered with a refractive coating to help disperse the heat experienced from Covenant energy weapons. However one or two direct hits from any plasma weapon will compromise the armor plating. Introduced with the Mark V, this layer allows a starship-grade AI to travel with a soldier into the field. The AI can then aid the soldier in software intrusion, hardware hacking, and espionage by listening to enemy chatter. These strips are very small yet powerful magnets place on the legs, waist, and back of the suit and is used to hold any equipment with a magnetic property. The suit also contains an electromagnetic system on the boots of the MJOLNIR suit that allow its wearer to stay attached to a metal surface in zero G environments and can be toggled on or off by the wearer. Unsuccessfully tested with the Mark IV, properly introduced with the Mark V, and later refined with the Mark VI, the energy shield device is reversed engineered from Covenant technology. In 2532, forty scientists and technicians would spend the next 20 years attempting to make some use of the technology. For decades the attempts at cracking their technology had met with failure after failure, some had given up and others in the scientific community believed the energy shield technology could never be cracked. However at some point in the late 2540s a breakthrough was made and for the first time the UNSC had successfully cracked and improved upon the technology. Integrated into the final production model of the Mark IV in 2531, the microfusion cell is the most vital component to the Mjolnir system, as it provides power to all components of the armor. The reactor is built into the suit and allows for nearly unlimited power. The fusion reactor is half the size of a normal fusion pack. Pre-2531 versions of the armor use a nuclear fission reactor as a source of power. However, because of the delicacy and radioactive nature of the fission reactor its use was limited until it was replaced with a fusion plant in the final production model of the Mark IV. The power supply control unit controls the power supply of the armor. This system functions as a self-destruct mechanism in order to prevent a dead Spartan's armor from being compromised by hostiles. It is activated by a series of digits that only the Spartans know. When engaged, it produces a reactor overload that burns everything within a ten-meter radius, then produces a large blast. The Limited Edition of the Xbox 360 action RPG Fable II includes a set of MJOLNIR armor for the player's character to wear. It is called "Hal's Armor/Outfit". Additionally, the player can obtain a longsword with a crystal blade carved in the shape of the plasma envelope of the Energy Sword called "Hal's Sword". The name 'Hal' (obviously derived from 'Halo') is described in-game as the name the citizens of Albion gave to a mighty hero from another world. Also in the downloadable Knothole Island add-on, in the "Box of Secrets", the player can unlock 'a rare ranged weapon', "Hal's Rifle", which is an assault rifle. The Delta-6 Accelerator Suits in the film GI Joe: The Rise of Cobra seem to be inspired by the MJOLNIR suit. In addition to its very similar appearance, the Delta-6 accelerates the wearer's speed, enhances their strength and agility, and has a "thought-to-action" feature. Stuart Beattie, the film's screenplay writer, is an avowed Halo fan and has written multiple unendorsed scripts for a Halo film. Shi Kai Wang's preliminary sketch of John-117 in what would become the Mjolnir Mark V for Halo: Combat Evolved. Concept art of John-117 undergoing armor diagnostics for Halo 2. A redux of the MJOLNIR Mark V for Halo 3. A Mjolnir Mark I helmet with a cracked visor in Halo: Fall of Reach. Kelly-087 fighting Mjolnir Mark I-clad trainers. 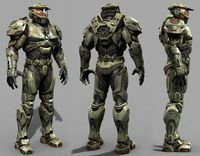 An early concept of a Mjolnir armor in Halo 4. Concept for an up-armored Mjolnir suit for Halo Wars 2. John-117 in a suit of Mjolnir in the Halo Infinite - E3 2018 - Announcement Trailer. ↑ Halo: The Essential Visual Guide, page 119: "Energy shielding was a key feature of Mark V, although other Spartan squads had field-tested prototypes of this technology as early as 2531." The Grenadier variant, introduced four years later, also served as a test bed for energy shielding.